I've known this plant for as long as I can remember, on account of its cute heart-shaped seed pods. Seeing it coming up all over my legume bed (it's doing rather better than the peas and beans, if I'm honest), I was struck by its similarity to brassicas. Looking it up, I found that it is indeed a brassica, and all parts of the plant are edible. Apparently the young leaves are very good in early spring, but I've missed the season for those as they're not so good once the plant has flowered. Some people use the seeds, either as they are or ground into meal, but I suspect the only people who do that are those who have small children to employ in the harvesting of said seeds. The seed pods have a peppery taste and can be used as seasoning. I picked one and tried it and sure enough, it had a distinct peppery bite. Harvesting even the pods turns out to be quite fiddly as they're so small and the stalks are wiry and tend to come off the plant with the pod, so need trimming off afterwards (or more careful picking in the first place). I have to admit, when I cooked a handful of these in a stew, I didn't notice the flavour, but then I wouldn't particularly notice pepper if I'd added it to stew. I'll persevere with this plant; I think it's probably one worth knowing about. Evil midges intent on eating me alive. Also out of focus. These have potential to be a useful flavouring, if I get the hang of using them properly, but I'm not immediately impressed. Wild garlic (this is pretty much over now, even here. The flowers are setting seed and the leaves are yellowing, but I picked a couple anyway). Enough rambling - on to pignuts. These are a tricky subject for a foraging post. They've been on my to try (via learn how to identify ) list for some time, but if they're growing wild it's actually illegal (in the UK) to harvest them. This isn't specific to pignuts; whereas picking leaves and fruit is permitted, destroying plants is not allowed. This means that any root crop is technically illegal to harvest unless it's growing on your own land (or you have the landowner's permission). Things like dandelions are so abundant that I can't see anyone seriously objecting if you dig a few of them up, but pignuts aren't quite in that invasive category. Illegal or not, I still wanted to learn to identify pignuts, and was very pleased when Jade pointed them out to me (with cautions about digging up) when I was on the foraging course. Then last weekend we visited our friends Adrian and Ellie in their new home. While the boys went off to an airshow, Ellie and I spent a lovely day exploring the nearby countryside and peering at wildflowers. I spotted some pignuts. Then I spotted some more, and then they were everywhere! With such an abundance, I decided that it would be OK to dig up just one, to try. I didn't have my camera with me, but Ellie did and kindly lent me hers, so here are a couple of pictures. 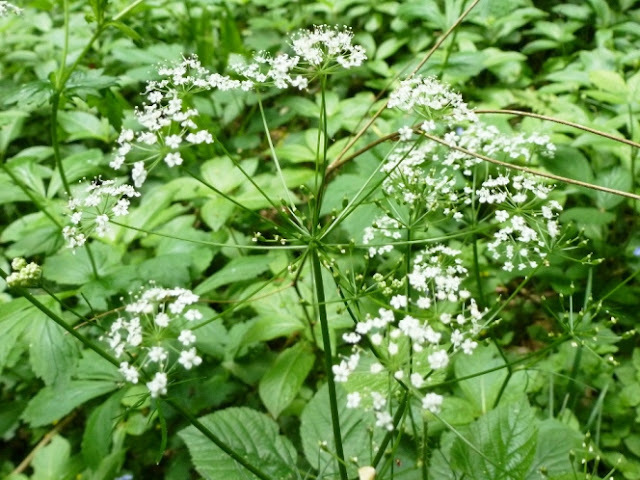 From the flowers you'll see it's an umbellifer, meaning, Take care not to confuse this with poisonous relatives. I carefully dug around the base of the plant and found the small, nut-like tuber, not buried as deeply as it might have been (they can be several inches down). I didn't get a photo, but it looked very much like a hazlenut (the bit you eat, not the shell) and once I'd scraped the skin off and tried a nibble, tasted somewhat like a fresh hazlenut, too. Ellie tried it and commented on a hint of radish flavour as well. I'd certainly like to eat more of these, so what I need to do now is find some locally, keep an eye on them for the ripening seeds, then collect some and plant them in my garden, so I can dig them up without worrying about disturbing their natural distribution or, indeed, breaking the law. What with getting distracted by seaweed last week, I almost missed the best time to harvest this one, as it's the young shoots that are favoured, and they're already turning into stalks of grown-up leaves. I haven't tried this before, but spotted some plants last year and noticed recently that they're coming up again. I went out this evening to cut a few leaves for dinner, deciding to take some from the busier, closer road rather than walking further to a quieter road, as dinner was already cooking. Having brought my bounty home, I then spent a slightly panicky twenty minutes looking up how distinguish this edible plant from its dangerous relative, the giant hogweed. At this time of year they're not very giant, so quite difficult to tell apart. Giant hogweed has sap that, in combination with sunlight, can cause nasty blisters and permanent damage to your skin. I'm not going to try and tell you what the difference is - I'd rather not take that responsibility - but do look it up for yourself if you're tempted to try eating (or even touching) this plant. Having satisfied myself that I had indeed picked food, not a monster, I put my leaves in the steamer and set it over the simmering stew for about ten minutes, by which time they looked fairly cooked. 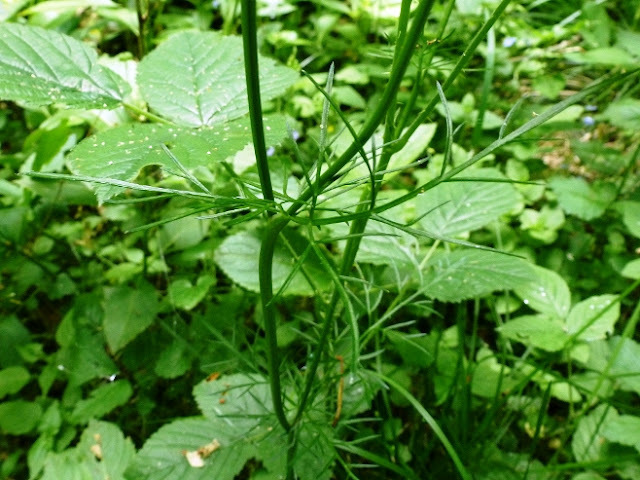 Like many foraged greens, these have been described as tasting like asparagus. They don't. Nonetheless, I quite liked them. The texture's not great - a bit fuzzy - but they have a strong-ish flavour that isn't the usual grassy or bitter green. Worth harvesting again, I think.